Today, JU’s newest vocal performance ensemble, RiverTones, enters its second year with big plans to bring a little jazz to campus. The group’s inaugural year also marked Barone’s first year with JU. Coming from Douglas Anderson School of the Arts—a local, nationally recognized high school and Duval County magnet program—Barone there focused on vocal technique and the development of a new show choir. She eagerly awaits JU vocal auditions scheduled for move-in weekend. Sunday, August 26, from 1:00-5:00 PM in Sam Marks Chapel. All are welcome to participate. One of the unique qualities of these auditions is the one-stop approach. Applicants for University Singers, RiverTones, and Service Learning all share the same audition date and space. For those aspiring to join the RiverTones, a prepared jazz vocal standard, sight reading skills, and tonal recall are part of the process. Afterward, students may be assigned to one or more groups. Some students participate in these performance groups to fulfill scholarship requirements. For them, the audition serves as more of a placement opportunity. The the makeup and size of the ensemble, Barone says, is dependent upon the experience and vocal ranges of those who audition. Charlotte “Charly” Adams (‘18), Shauna Clark (‘19), Alexandra Gravina (‘21), Brittanie Llorens (‘18), Carly Mosley (‘20), Zoe Lin Rosas (‘19), Andrea Vilarino Gonzalez (‘19), and Kelly Wolfe (‘19) helped RiverTones make a big splash in its first year. In addition to performing in JU’s 2018 Commencement ceremonies, the RiverTones maintained a busy schedule from day one. 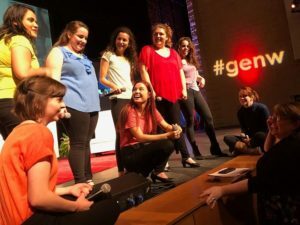 “The highlight of the year was the national Generation W (GenW) conference. Our group opened the entire conference. It was amazing,” Barone says. With more than 25 years of private vocal instruction experience, Barone’s goal for the new group was to raise its profile as a premier ensemble. Their first-year performance schedule showed they were well on the way to that goal. Donna Orender, Founder and CEO of GenW, attended JU’s annual holiday concert, Make We Joy. There, she first discovered the RiverTones. An invitation to perform for GenW 2018: Rise and Shine quickly followed. The group selected “This is Me,” from the popular 2017 film The Greatest Showman. They hoped to inspire all women attending the conference regardless of their individual backgrounds, challenges, pathways, or dreams. Much intentionality went into the song selection, and efforts made to remain sensitive to current hot-button issues ranging from the proverbial glass ceiling to the #MeToo movement. Dean of JU’s College of the Fine Arts (CFA), Dr. Timothy Snyder had only positive things to say about the ensemble’s addition to the College. The group rehearses three times a week, a demanding schedule Barone says, but absolutely necessary for the difficulty level of music the group tackles. As director, Barone collaborates weekly with Professor of Music and Director of Vocal Studies Kim Beasley, Staff Collaborative Pianist Prof. Edith Moore Hubert, and Mamie Lou Small, 2018-2019 CFA Fellow. Mr. Scott M. Giddens of Jackosnville will assist as accompanist to the group this academic year. It is unusual to find such diversity of performance opportunities in a small liberal arts setting—orchestra, wind ensemble, percussion ensemble, string quartets, jazz ensembles, marching band, choirs, music theater shows, opera, electronic music, arts outreach, an on-campus recording studio, and the JU record label. That range is what you might find at a much larger school. 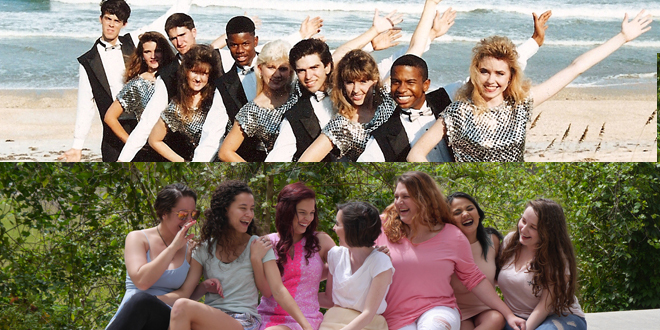 For more information about upcoming auditions, contact Prof. Beasley at kbeasle@ju.edu, or call 904-256-7389. Prof. Beasley is also available to field inquiries beginning August 20, in the Phillips Fine Arts building, Room 216. Visit JU’s College of Fine Arts online for the latest updates on programming, JU’s Performing Art Series, and other helpful information for prospective students.